Trembling Bells aim to bring the music of the Incredible String Band and Fairport Convention into the new millennium. Merrie old England: land of Robin Hood, Sunday roast, and the Kinks -- three very good things. It’s also the land of Tony Blair, sexual repression, and Benny Hill, but who’s counting? The nostalgia for a lost Britain, one that might never have even existed, permeates Carbeth, the debut album from UK band Trembling Bells. Playing old-school psychedelic folk with just a hint of Americana, Trembling Bells aim to bring the music of the Incredible String Band and Fairport Convention into the new millennium. It’s a pretty ambitious endeavor, and while freak-folk isn’t likely to knock Lady Gaga off the charts any time soon, Trembling Bells aren’t here to sell records. At times, that’s their greatest weakness: a little tuneful concession might lift the album up when it drags. But for the most part, Carbeth is comprised of thoughtful, elegiac folk tunes beefed up with electric guitar and a strong rhythm section. Masterminded by drummer Alex Neilson, an improviser who’s spent time with Bonnie “Prince” Billy and others, it’s no surprise that Trembling Bells have a tight, musically proficient sound. It certainly doesn’t feel improvised; though it often wanders, Carbeth never really gets lost along the way. The worst you can say is that it takes the scenic route. While Neilson has a good way with melody, the melodramatic warbling of female vocalist Lavinia Blackwall threatens to unhinge the whole undertaking. Her voice is technically impressive, yes, but it feels out of place with the often delicate, folky aesthetic of the album. It works best on lovely, operatic numbers like “Willows of Carbeth”, but on the seemingly endless “Garlands of Stars”, she’s nearly unbearable. Neilson’s own reedy voice makes for a refreshing contrast, especially on “Your Head is the House of Your Tongue”, where he sounds more like a free-folk prophet than your typical drummer. But the album works best when its singers work together, which is why the duet “Seven Years a Teardrop”, clocking in at a trim three minutes, is both the album’s highlight and its elegant finale. It’s also what makes “I Took To You (Like Christ To Wood)” so memorably lovely, even if Christ and wood probably had a somewhat antagonistic relationship. Elsewhere, the Sufjan Stevens vibe on “The End is the Beginning Born Knowing” comes with lyrics as silly as its title: “I found Buddha/ on a black hill/ judging people.” Really? 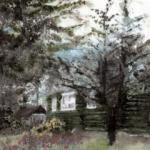 When Neilson and co. put the effort into the music (and the lyrics), then Carbeth is a moving portrait of a lost way of life; it’s a celebration of the world pictured on the album cover, a small cottage hidden in rustic greenery. When they take the easy road, it’s everything you’d expect and nothing more. With odes to the music of the 1960s, Trembling Bells know enough to place themselves firmly within the past and still nudge it, ever so slightly, towards the future. At its best, Carbeth evokes memories of English summers and visions of Stonehenge (staying, most of the time, out of Spinal Tap territory). There’s a fine line between psychedelic and just plain silly, but Trembling Bells are smart enough to keep it musically together.